In 2009 a friend invited me to volunteer with the heart association to assist with the preparation of the Go Red fundraising auction & luncheon. 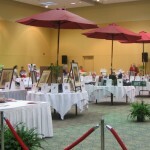 That year the organizers were trying some new pre-luncheon events bringing attendees in early to peruse the auction items. In addition to the auction and luncheon there were complimentary cooking demonstrations, massage, mani/pedi mini manicures and hair styling. 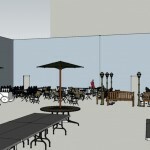 In discussions about the event, it became clear that I could assist with the layout of the varied activities within the venue. 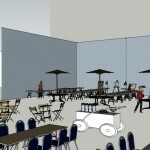 I produced preliminary sketch-up layouts of the space to examine how the space should be organized. 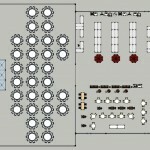 In addition I designed and created the centerpieces on the tables at the luncheon. 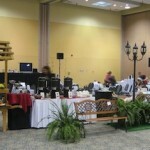 The group had a small budget, some small vases and some large vases but not enough of either for all of the tables. I suggested that a medium size could be introduced and all of the vases could be tied together with similar flowers and colors. 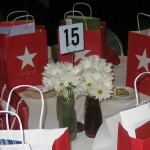 Because the event was a “Go Red” luncheon the consistent color was red & white. I chose daisies as the flower because they were cost effective, fit into the small vases, and provided good mass when grouped. 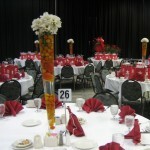 The small vases were grouped to fill the table center with red, white and clear vases of daises. I introduced the red color into the medium and large vases with apples and tomatoes. This introduced a unique element and aligned with the Heart Association message of living a healthy lifestyle. 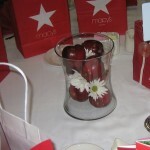 The apples in the medium vases are integrate with the daises through out the vase. Tomatoes and water fill the large vases that are topped with a group of daisies. Some of the tomatoes float while others rest at the bottom so that each large vase is distinctive.